The American federal system gives state and local governments the ability to experiment with different types of political institutions, electoral mechanisms and innovative public policies. The political cultures of these governments help define the legitimate activities of governments, how they should operate and who should participate. The study of state and local political culture in the United States has been dominated by Daniel Elazar’s model of the moralistic, individualistic and traditionalistic subcultures. More recently a “new political culture” has emerged based on economic and social changes. The study of political culture has been widely used, but it is not without critics who argue that other factors have more influence on policies at the state and local level, and that culture is too difficult to define. The United States has a federal system of government that divides powers between the national and state governments. The national Constitution outlines the powers of the federal government and reserves the rest of the functions to the states. In practice many areas of policy are shared by both levels of government and the cooperation between them has been termed the “American Partnership”. There is no formal discussion of local government powers in the Constitution. States empower municipal governments through their constitutions and statues. However, even though localities are reliant on delegated powers they have latitude to develop their own policies. The power sharing enshrined in the federal system allows each level of government to develop policies that suit the distinct needs of their constituents. The underlying values that affect the processes they use to adopt these policies, including who can participate in decision making and the acceptable forms of government action are known as political culture. Scholars in this field have attempted to describe the different types of political cultures throughout the country in an effort to understand patterns of political behavior. Daniel Elazar developed the preeminent examination of political culture of American state and local governments in American Federalism: A View from the States. He defined political culture as “the particular pattern of orientation to political action in which each political system is embedded” (Elazar 1966, 78). Elazar viewed political culture as the underlying semi-permanent characteristic that explained how state and local polities functioned. The attributes enshrined in a political culture were the consequence of ethnic and religious values of settlers in specific regions of the country. These groups migrated west and took their unique political cultures with them to their new settlements. The established political cultural values were passed from generation to generation and new migrants to an area were assimilated into the existing political mores. Elazar argued that political culture helps explain state activities within the federal system and allows for an understanding of how they interact with the national government in the context of intergovernmental relations. Political culture subtly affects state government operations in three ways. First, it helps set the perceptions of the purposes of politics and its range of permissible actions. Second, it sets the boundaries of who can participate in politics and how much public involvement is encouraged in the policymaking process. Finally it affects the way that government is practiced. This includes ethical tolerance of corruption as well as willingness to innovate in public policy. Elazar claimed there are two layers to political culture in the United States. There a national political culture based on two contradicting political dispositions. The first views the political system as a marketplace where groups and interests bargain with each other to achieve gains for their clientele based on self-interest. The second conceptualizes the political system as a commonwealth where groups set aside their personal interests and find solutions that are in the best interests of everyone in society. This common good is achieved through a consensus on “shared moral principles”. The national cultures are built on three political subcultures: individualistic, moralistic and traditionalistic. The individualistic political culture sees politics as a marketplace of competing individual interests who use the political system to better their own causes. Politicians and citizens are not interested in achieving a “good society” or furthering the common good, rather they are focused on private concerns. Political innovation is only undertaken if there is a public demand for services, at which point politicians will advocate for new policies to achieve electoral success and reap the spoils of office. Consequently the individualistic political culture is not issue driven, rather it is based on strong parties built on patronage and constituent service. Since the goal of politics is to distribute payoffs to supporters, there is a high tolerance for corruption in the individualistic culture. Politics in the individualistic political culture is a dirty business that is best left to the professionals and citizens are not encouraged to participate in governmental activities except to vote. The moralistic culture believes that collective action through politics is the highest calling and that participation in politics and the betterment of the greater good are the objectives of government. Political activities revolve around the community as opposed to individual enrichment and as a consequence, intervention into private activities is acceptable if it furthers a public good. Issues take precedence in the moralistic culture. Consequently, politicians are willing to initiate new solutions to policy problems even if there is no immediate electoral payoff. Political parties are secondary and there is a proclivity towards non-partisan solutions. Further, the emphasis on creating a good society precludes patronage politics and eschews corruption. Politics is clean and discourse is on the merits of issues rather than who will receive the spoils of office. Finally, participation in politics is both widespread and expected as a duty of citizenship. Moralistic states are more likely than others to offer citizens the opportunity to participate in politics through direct democracy. Finally, governments in the traditionalistic culture are designed to preserve the status quo and benefit elites. Power within this political culture is held by a limited group of wealthy landholders and business families that rule through their own elitist conceptions of the common good. Political participation by non-elites is discouraged and voter turnout is low in traditionalistic states. Only those who belong to the privileged classes through their social status are welcomed into the political realm. Party competition is generally non-existent in the traditionalist system. However, the dominant political party typically has a number of intra-party factions that compete with each other for power. The competition is rarely based on issues since elected officials are immune to electoral pressure and the elites have a consensual position on public policy. Each of these political cultures was geographically based in Colonial America. The moralistic states were primarily in New England. They were settled by religious groups that migrated from Europe in an effort to escape persecution and to establish their own ideal communities. Their ultimate goal was to create good society based on religious principles. The individualistic political culture was based in the Middle Atlantic states. These cultures were based on individual achievement and opportunity to pursue commercial success and wealth. Unlike the states to the north, they were focused on individualism rather than achieving community good. Finally the traditionalistic culture was rooted in the south. Agribusiness and the plantation economy, originally based in slavery and later in cheap labor, formed a variation of a feudal aristocracy. Elazar showed that migrational patterns of frontier expansion carried these political cultures almost directly westward. Consequently the northern tier of American states is predominantly moralistic, the southern tier is traditionalistic and states in between are individualistic. In the final analysis much of Elazar’s political culture is based on regionalism. Elazar’s typology has been the predominant model used to analyze political culture in relation to other factors that affect outcomes in state and local politics. However, one criticism aimed at his model is that it was largely impressionistic, based on Elazar’s reading of history and current events in each of the states. Numerous attempts were made to test Elazar’s theory in an effort to provide proof that it affected politics and to add additional means of understanding what factors affected state and local policy. Sharkansky (1969) was the first to do so and found that political culture was a better explanation of political participation, policy activism and the size of government bureaucracy than traditional indicators such as ideology and levels of economic wealth. Morgan and Watson (1991) found that the predominant religious affiliations of a state affected the political culture. For example areas with high proportions of fundamentalist and Pentecostal Christians also tended to be more traditionalistic. Other research has shown that politicians attitudes about decision making, the adoption of specific public policies and redistributive policy are related to Elazar’s political culture (Wirt 1991). One of the biggest critiques of Elazar’s political culture was that it did not allow for the input of new migrants into the existing political culture. The argument goes that while political culture may be slow to change, it is not completely static given the influx of new waves of immigrants and changing views on the purposes of government. Social and demographic changes in the United States have led scholars to develop new indicators of how place affects politics. Consequently they argue that Elazar’s scheme has been replaced by a “new political culture” based more on an urban-rural divide than the classic explanation based on states. The new political culture is based on a post-industrial, highly mobile society where people consciously choose their residence based on a package of factors that suits their lifestyles. Elazar argued that political cultures were carried west as the frontier was settled. The new political culture argues that settlement patterns are not as random. Rather, people now locate to various metropolitan areas around the country based on political culture. The core principal of the new political culture is that the economic issues that used to dominate politics are no longer the only sources of conflict in society. Fiscal and economic issues have declined in importance as Americans became more wealthy over the last half of the twentieth century. A new, highly educated segment of society now sees social issues such as gay rights and women’s equality as more important than the old politics of class-based economic policy. This new political culture also values a different sense of community than traditional political cultures based on “strong ties between families and friends, close neighborhoods, and the attributes that come along with such communities – civic clubs and vibrant electoral politics, to name a few” (Florida 2005, 31). Unlike traditional political cultures residents do not value unqualified patriotism and an unfettered belief in the virtues of a market economy. Weaker family and community ties create less exclusiveness and allow for more individualism in an inclusive environment. The new political culture is defined by cities that are socially diverse, have high levels of overall education, have a low level of religious adherence and are tolerant of non-traditional lifestyles including gays and lesbians and new family structures (DeLeon and Naff, 2004). Diversity and the presence of a post-industrial high technology sector are important indicators of cities with the new political culture. However, variations in the composition of these factors can produce different political cultures across cities. 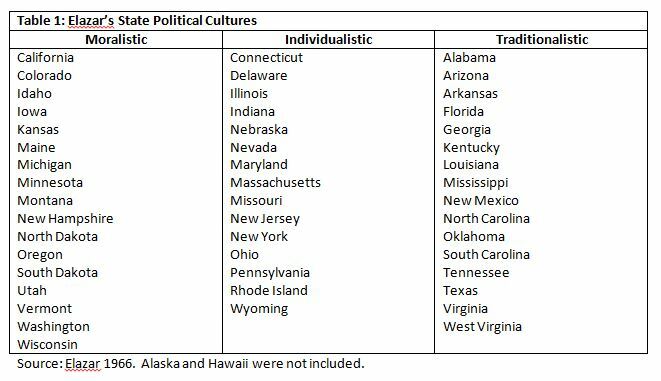 Florida (2005) provides four types of communities with distinct political cultures based on their levels of traditionalism. Classic Social Capital Communities are traditional cities that have high political involvement, high levels of community involvement, and strong religious involvement but rank low on the characteristics of diversity and economic innovation. Organizational Age Communities are cities that have been hard hit by the decline of the industrial economy and have had difficulties attracting new jobs due to a lack of innovation and the presence of a high-technology base. They are fairly traditional, have low levels of diversity and have a strong working-class base. Nerdistans are high-tech hubs with diversity, but have low political involvement and low community involvement. However, Nerdistans operate in a traditional urban pattern of growth that encourages “sprawl, pollution, and congestion”. Finally, Creative Centers have high levels of innovation, high tech industries and diversity, while scoring low on political and community involvement. These communities have found ways challenge traditional urban growth and create livable communities that are attractive to the highly educated work-force of post-industrial society that is indicative of the new political culture. Each of these types of cities has a different expectation of the role of government and the issues that it should address, as well as the appropriate levels of public participation in civic and political life. The study of state and local political cultures has had its share of skeptics over the years. There are two primary strains of disagreement with political culture as the explanation for why some governments behave differently than others. First, the difficulty of defining political culture creates problems. Political science attempts to create theories concerning the causation of political behavior. Consequently it attempts to create broad generalizations in order to explain as much activity as possible. Political culture is sometimes seen as a catch all theory that attempts to generalize too much and capture too many variables. In this light political culture is either based on impressions or an empty theory that tries to explain things for which we do not have any empirical evidence. The second major strand of criticism of the study of state and local political culture focuses on the fact that other variables have a greater effect on the outcome of policies. Primary among these is the belief that political cultures are nothing more than a synonym for regional diversity in the United States. Subsequently Elazar’s moralistic, individualistic and traditionalistic subcultures are just proxies for politics in New England, the Mid-Atlantic and the South. Further, the idea of the new political culture is just an explanation of how politics in the Northeast and Far West differs from the traditionalism of the South and Midwest. Other critics argue the structure of government often has profound effects on state and local politics. Consequently the way that powers are distributed within and among institutions such as the governor’s office, the state legislature and city councils create different types of politics that are not explained by political culture. A final criticism states that cities and regions are unable to realize any full potential of their own political cultures because of the constraints placed on them by the American federal structure. Thus true “progressive” politics that might be related to the moralistic or new political cultures cannot be truly achieved because of the competition that takes place between governments in the American system. State and local political culture has been studied widely in recent years in an effort to determine why states have different attitudes towards the appropriate activities of government and the levels of citizen participation. The main theory of political culture developed by Daniel Elazar focused primarily on the effects of ethnic and religious influences in the creation of the individualistic, moralistic and traditionalistic subcultures which spread through the United States. More recently scholars have argued that demographic and economic changes have created a “new political culture” based less on the economic cleavages and more on “post-material” values. All of the theories of state and local political culture are subject to scrutiny since other variables also seem to explain governmental behavior. The American federal system gives great latitude to states and local governments to structure their own governments and create public policies. As long as this is the case, there will be intense interest in studying political culture as a means to understand why some governments behave differently than others. DeLeon, Richard E. and Katherine C. Naff. 2004. “Identity Politics and Local Political Culture: Some Comparative Results from the Social Capital Benchmark Survey”, Urban Affairs Review 39:689-719. Elazar, Daniel J. 1962.The American Partnership: Intergovernmental Co-operation in the Nineteenth Century United States. Chicago: University of Chicago Press. Elazar, Daniel J. 1966. American Federalism: A View from the States. New York: Thomas Y. Crowell Company. Florida, Richard. 2005. Cities and the Creative Class. New York: Routledge. Lieske, Joel. 2010. “The Changing Regional Subcultures of the American States and the Utility of a New Cultural Measure.” Political Research Quarterly 63: 538-552. Morgan, David R. and Sheilah S. Watson. 1991. “Political Culture, Political System Characteristics, and Public Policies Among the American States.” Publius: The Journal of Federalism 21:31-48. Nichols Clark, Terry. 1996. “Structural Realignments in American City Politics: Less Class, More Race, and a New Political Culture.” Urban Affairs Review 31: 367-403. Nichols Clark, Terry and Vincent Hoffmann-Martinot, eds. 1998. The New Political Culture. Boulder, CO: Westview Press. Peterson, Paul. 1981. City Limits. Chicago: University of Chicago Press. Rosdil, Donald. 2011. “Civic Culture, Sub-cultures, Non-traditionalism and Progressive Policy: Using Value Change to Explain New US Development Strategies in the 21st Century”. Urban Studies 48: 3467-3486. Sharkansky. 1969. “The Utility of Elazar’s Political Culture: A Research Note.” Polity 2: 66-83. Sharpe, Elaine B. 2005. Morality Politics in American Cities. Lawrence, KS: University of Kansas Press. Sharp, Elaine B., Editor. 1999. Culture Wars and Local Politics. Lawrence, KS: University of Kansas Press. Wirt, Frederick M. 1991. “’Soft’ Concepts and ‘Hard’ Data: A Research Review of Elazar’s Political Culture”. Publius: The Journal of Federalism 21: 1-13. Local Governments and Plastic Shopping Bags: To Ban or Not to Ban? In the cities of Portland, Eugene, and Corvallis, Oregon the distribution and use of plastic shopping bags are no longer legal. The city of West Linn, OR is moving on legislation to also ban these bags. Plastic bags are polluting the environment, collecting in the rivers and the Pacific ocean. These bags destroy ecosystems, water ways, habitats and also kills/injures animals. In some places in the Pacific, it even “out weighs plankton”, now that’s a pretty significant amount of plastic. Plastic bags are also difficult to recycle because even countries like China no longer accept these plastics to be recycled. It is actually an expensive process to recycle these bags and is much cheaper for companies, people, and the government to put them in landfills. Basically there is no easy way around the use and pollution of these plastic bags. Legislation that would ban the use of these bags would force companies and businesses using these bags for economical reasons to stop, and would prevent any financial burdens of anyone having to attempt to recycle them. The idea is to change our actions and choices, so that people use alternatives. Brilliant idea- who would have thought there were substantial alternatives to things like plastics, and even energies?! A new non-profit organization is taking the lead in residential solar panel installation in local communities throughout the United States. SmartPower is working to make solar power more affordable for homeowners and to change the marketing techniques used by many solar power companies. It is interesting to see that national organizations are trying to make an impact on solar energy production in light of the recent failure of President Obama’s investment in the solar company Solyndra. When only three percent of people in the United States use some form of solar energy, someone has to take initiative in helping to promote the use of solar energy, and citizens of the United States are not likely to be interested this kind of action coming from the Federal government due to the fact that Obama’s recent activity in this area has not been successful. SmartPower has praised the efforts of the government of New Jersey for continuing to lead the way with incentives for installations of renewable-energy in residential and commercial buildings. SmartPower ranks New Jersey as the second best state in the nation in terms of homes and businesses with solar panels installed. The Solar Energy Industries Association says that New Jersey also has the most favorable net-metering standards in the country. If non-profit organizations geared towards solar energy production combine with state and local governments, the country could make a lot of progress on the problem of a lack of solar energy use in this country. The town of Dryden, located in New York, is a quiet space full of farms and ranches. However, in August 2011, the town passed a zoning law that bans fracking after a long time of lobbying against it. The ordinance created a lawsuit being looked over by the Court of Appeal, the highest court. The ruling will settle the issue of being able to drill or not. Fracking is increasing significantly; other places have created bans against fracking causing legal action to up rise. The passing of these ordinances and lawsuits of hydraulic fracturing is going to define the future of oil and gas industries in New York. Local governments are taking a stand and putting in time and effort to stop fracking. The State Health Department has gotten involved with the issue. A study was ordered by the Department of Environmental Conservation to guide decisions on fracking. People who support hydraulic fracturing believe a new industry can be introduced creating more jobs and decreasing the unemployment rates. On the other hand, others especially environmentalists know the impacts on watersheds and aquifers are not good due to the water use and release of chemicals released into the ground. Recent polls show that 43% of voters oppose fracking and 38% approve. There still have been no decisions about fracking. This can be a result of next year’s second term elections. If you look at hydraulic fracturing as a great economic booster, then it benefits NY. However, is that short-term economy booster worth the long-term environmental effects?